Rodizio Grill menu prices page. 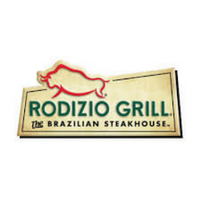 Rodizio Grill is the first authentic Brazilian Steakhouse in the United States. Also known as a “Churrascaria”, this award-winning restaurant offers customers succulent rotisserie grilled meats, unique salads, and homemade-style desserts. Customers will enjoy how gauchos (Cowboys), with three-foot skewers of meat that have been grilling over an open fire for hours, parade in the restaurant providing diners with carved pieces of meaty goodness. Become a Club Rodizio member and receive exclusive discounts, invitations to special events and advanced reservation privileges. All locations are open for Lunch and Dinner during the week and for Brunch and Dinner on the weekends. Below are the latest Rodizio Grill menu prices. Rodizio Grill fans can enjoy an extra special birthday celebration by joining the Club Rodizio. Members receive special offers and promotions plus a gift for their birthday. Sign-up is free and can be completed on the Rodizio Grill website. Developed in 1995 by Sao Paulo born Ivan Utrera, the owner decided to bring the churrascaria to the country because he grew up eating the churrasco or barbecued meat and knew that Americans will love it too. With the conceptualization of the traditional Brazilian dining style and armed with the cherished family recipes, Utrera, and his mother Carmen made it an even better experience for everyone when they began creating new rotisserie meals coupled with tasty desserts. Best of all, the restaurant even offers Children’s Meals and Sunday Brunch with price starting from as low as $5.99. The Rodizio Grill is now considered as Ambassadors of Brazil. That is why the owners try to incorporate as much of their heritage and commitment to the restaurant. Their baker, who has been with them for eight years, adds to the authenticity by creating freshly-baked batches of bread on a daily basis, based on original recipes from Brazil. For more information about Rodizio Grill, visit their official website.